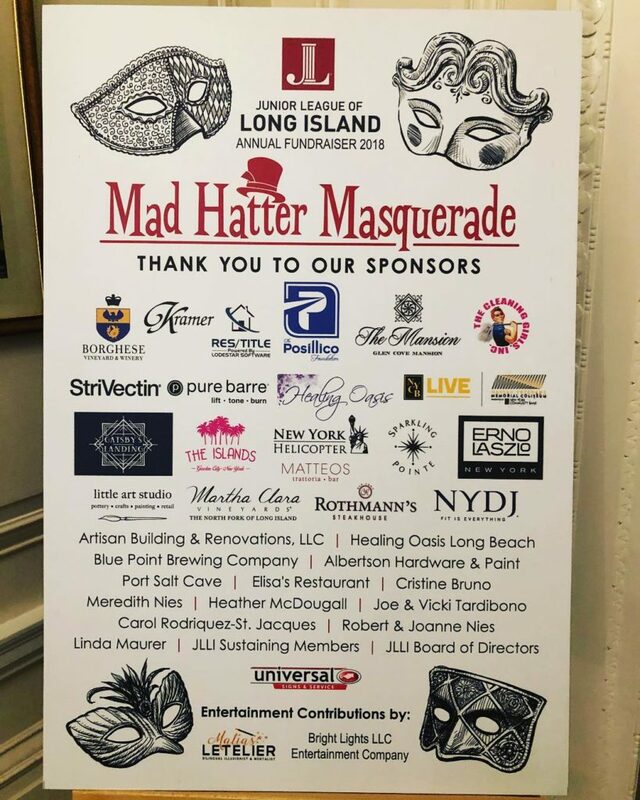 On Friday, March 23rd, the Long Island community joined us “down the rabbit hole” for an evening in Wonderland as we hosted our annual fundraiser at the iconic Glen Cove Mansion. It was an elegant and special evening, bringing together members, family, and friends to celebrate our groundbreaking community service projects and the women volunteers who dedicate their time and talents year-round. 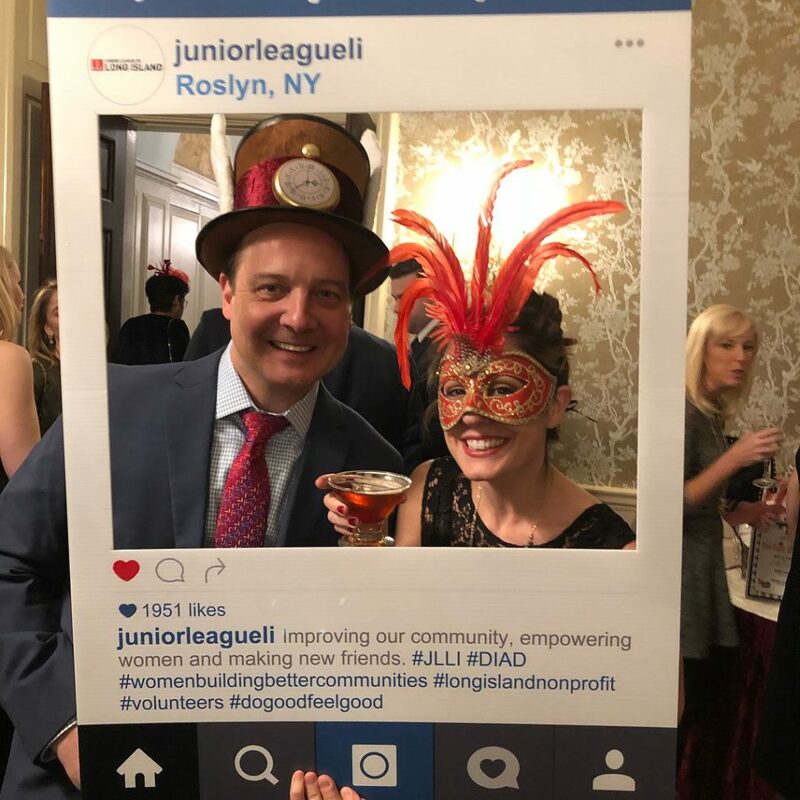 For the 2nd Annual Masquerade benefit, the committee put a whimsical spin on the traditional masked event to incorporate top hats and fascinators into the fun. Guests arrived dressed to the nines in beautiful evening wear accessorized with intricate masks and royal-inspired headwear. Some of the most notable ensembles included JLLI President Caroline Tice’s extravagant white feathered mask and President Elect Tracy Pfaff’s stunning red showstopper. Even the men got in on the fun – Bob Nies (father of member Meredith) sported matching gold top hat and bowtie, while Lou Yonke (husband of member Joan) seemed to have stolen the most quintessential version from the Mad Hatter himself. The evening was full of activities and excitement. Guests entered into the Crystal Room filled “to the brim” with outstanding raffle baskets, almost all valued at over $200 each! There was truly something for everyone from Disney on Ice tickets for the kids to a Pure Barre basket for the fitness buff to a high-end restaurant package for the ultimate foodie. This year’s raffles were truly extraordinary and could not have been possible without all our AMAZING donors. In fact, for the first time ever, we raised over $750 prior to the event by enabling online raffle purchases thanks to the Communications team. As guests entered the main ballroom, they were greeted by DJ Paul Meyer of Bright Lights Incorporated, who graciously offered his services at an unbeatable rate. DJ Paul kept the crowd going throughout the entire evening and had everyone on the dance floor as much as possible. Adding to the unpredictable playfulness of the evening was master illusionist Matias Letelier. Not only was Matias able to delight every single guest with a display of close-up magic at their seats, but his showcase performance left jaws dropped in astonishment. Matias exuberantly personalized his routine to include the JLLI mission and even roped multiple members including Ashley Cohen, Kely Yeamans and Laura Collins into the act. Thank you to them, their significant others, and all those who participated with Matias for helping to make it a memorable evening. Just when you thought there couldn’t be more, the committee unveiled a sweet surprise – a fully-stocked Candy Bar sponsored by The Posillico Foundation. One of the most popular parts of the event, this special treat, provided the perfect ending to a wonderful night. This year’s event was truly magical and full of spirit from all the detailed décor to exquisite entertainment. There will never be enough ways to say thank you to the people who made it all happen especially co-chairs Meredith Nies and Heather McDougall. Special thanks to committee members Vicki Creteur and Melissa Beyer for their tireless work on this event, as well as members of our Board for going above and beyond to help.